Compare prices on car hire in Clermont Ferrand from all the major brands and find the best deals. When you book through us, unlimited mileage and insurance are always included in the price given. Clermont-Ferrand is a city in central France . 360 km south of Paris .The city is the capital of the Auvergne region in the department of Puy-de-Dôme. Approx. 140,000 inhabitants live in Clermont-Ferrand, 261,000 with the suburbs. The city lies on a plain, and is known for a number of volcanoes, Chaîne des Puys, located around the city. The highest, Puy-de-Dôme, located 13 kilometers outside the center. Clermont-Ferrand, founded by the Romans as Augustonemetum, and became bishop ca. year 250 The city is one of France’s oldest. The city is the birthplace of the philosopher Blaise Pascal (1623-1662). The suburb Royat located 430 meters above sea level, is a summer tourist resort with mineral springs. 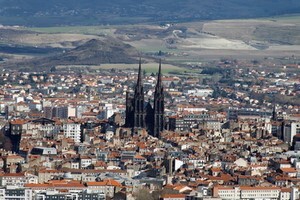 In Clermont-Ferrand there are sites such as archaeological and natural history museum. The old city is the senromanske Notre-Dame-du-Port basilica from the 1100s and a Gothic cathedral from 1100 to 1400’s. At the Place de Jaude there is a large statue of Vercingetorix sitting in a hoarse. It is designed by Frederic Bartholdi, who designed the Statue of Liberty in New York. Aéroport Clermont-Ferrand Auvergne is about. six kilometers outside of Clermont-Ferrand.